I am fortunate to work in an office building equipped with a locker room and showers. However, they are closed until September of this year for an accommodation remodel. What’s a lunch break runner to do? 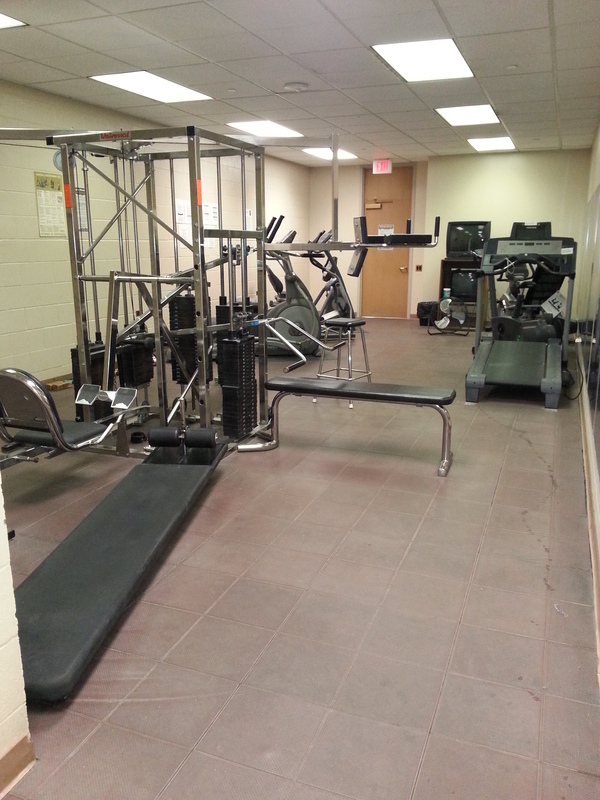 Luckily the office building across the street also has a locker room and showers AND an exercise room with equipment. Even better for me, I happen to work frequently with the lady in charge of assigning lockers. I did have to pare down my locker essentials quit a bit though. I went from full size lockers in my building to half size lockers in the other building. It actually came a great time though. Let me explain…using dumbbells has been a part of my training regiment for a while. I started with 2 pounder, then moved up to 3 pounders. I received a 30-day arm challenge from a friend, and as I never back down from a challenge, I quickly accepted, but felt like I was ready for 5 pounders. Lo and behold, my hubby had asked for a weight set for Christmas and it was received, you know the somewhat fancy kind where you can screw on different weight plates. The smallest weight we could make them was 8 pounds with the bar, and I was able to complete the arm challenge with that. 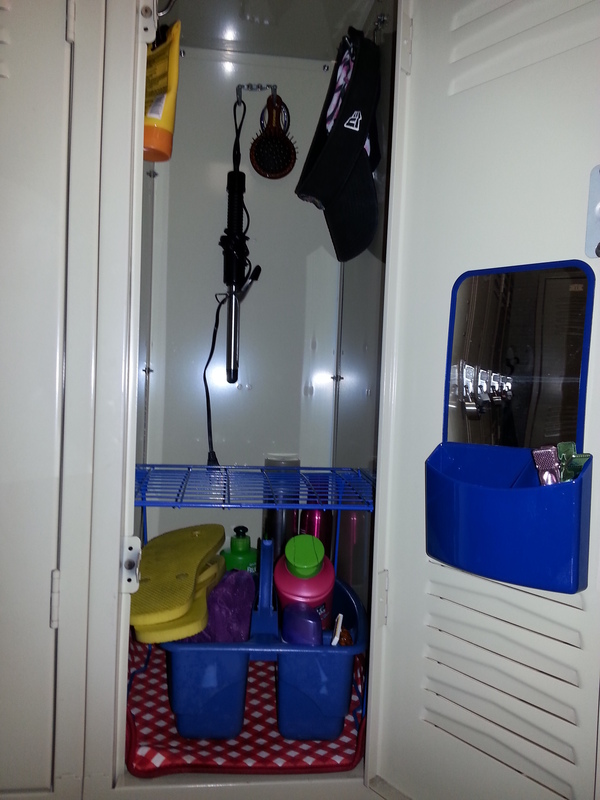 However, since we were sharing them and the hubs usually does his work out during the day when I normally would, I opted to do mine in the evenings to save the locker space, and to keep from toting them back and forth from home. I am also having to change up my usual running paths. 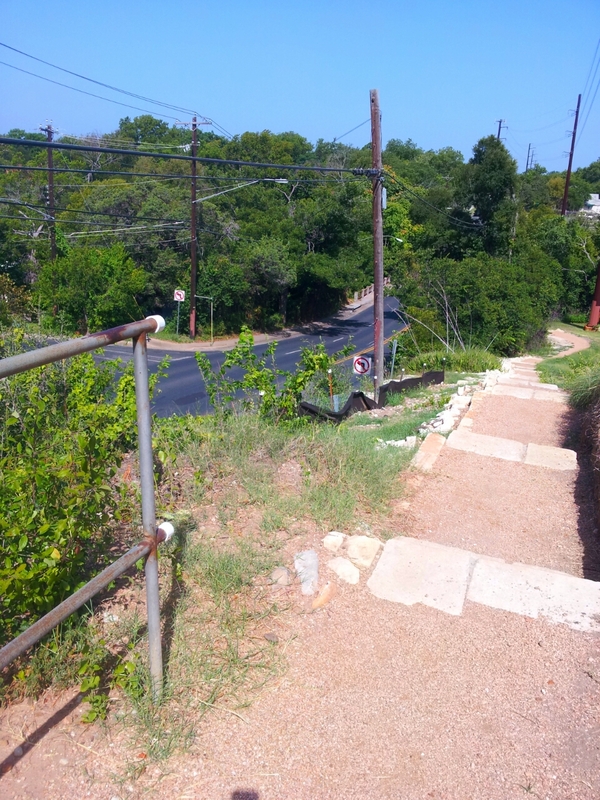 I don’t like having to cross many busy streets in Austin and my office building is flanked by two major ones. Therefore, I have now started running in a different direction and am becoming more comfortable with the various route options and hills. 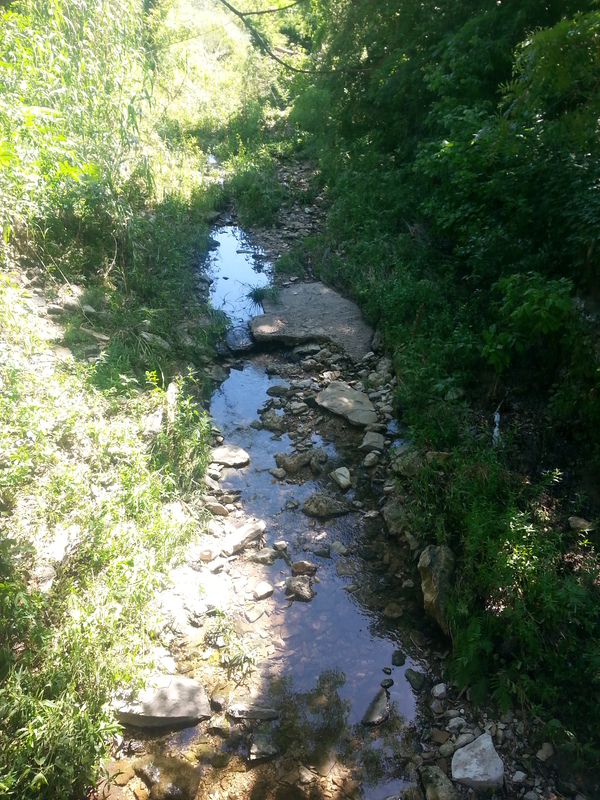 I came across this hidden pathway today, the infamous Shoal Creek. I doesn’t look like much, but when it rains in Central Texas it pours and this thing becomes a small river. For Lent this year I chose clean eating, while giving up all breads and sugars, while fasting one day a week. I lost a total of 27lbs. and feel wonderful. My hubby got in on the gig about two weeks after the start of Lent and has done so well too. I didn’t stop at the end of Lent either, we are keeping it going, although I do allow myself to have some bread now. I tried going with a healthier option, whole wheat bread and pizza crusts, and switched the kiddies to it too for their sack lunches. However, I recently learned that wheat bread hinders your body’s ability to absorb iron. That’s not exactly the news I wanted to hear as I’m bouncing in and out of anemia. Diet is not the only thing I changed up. I have now been through a 30 day ab challenge, 30 day arm challenge, 30 day squat challenge and am now in the middle of a 30 day yoga challenge and 30-day beach body challenge. The ab challenge helped me lose some serious poundage around my waist line and the squat challenge helped me slim down my thighs a bit. I’m a little disappointed in the arm challenge. While I feel stronger than when I started, I didn’t tone my arms or lose a lot of weight there. Although I’ll be the first to admit that my flabby arms have been the most troublesome spot I have so I know it will take a whole lot more to shape them up. The yoga challenge has been a nice break from lifting weights, but kind of boring and not very challenging. My favorite challenge so far has been the beach body challenge. Everyday is a different set of exercises rather than targeting a certain area. You can find loads of free “30-day” type challenges on Pinterest; follow my Work It Board to get you started. I have never done anything special for lent. I could never decide what to give up or do differently in past years. I watched a dear friend of mine beat a food addiction and lose 94 pounds. She started her journey to recovery and health for lent last year., using a juice fast and following Joe Cross’s lead. I wanted to give up sodas, sugar, breads and pasta for lent – a.k.a. all of my downfalls. Bust then I toyed with doing a juice fast too, or maybe a vegan diet, vegetarian, or now this “clean eating” craze going on. Well, I don’t have a juicer and it’s not in our budget to buy one; I like eggs and cheese too much to go vegan; I like turkey, pork and chicken too much to go vegetarian. My friend is now following the “paleo” diet but I am realyl just not a fan of red meat and again am a fan of milk and cheese. I was discussing lent plans with a coworker who was considering the “Daniel” diet – again, too much red meat for me. Dinner – a salad with whatever I have on hand including bell peppers, eggs, cheese, and chicken *gasp*! I also included a complete food fast on Thursdays, only drinking water. I was reading a priests commentary on how he fasts one day a week each year during lent. I want to use this fasting day as a time to reflect on myself and how I am transforming into who God really wants me to be. I started preparing for lent several weeks before. In mid-January I stopped drinking sodas. I used the step down method by replacing my usual soda with tea. From tea, I then started replacing it with water. In February I started buying more salads, limiting my break intake, and took most of our sweets to the office to let my coworkers finish them off. I was now drinking notion but water all day long with the exception of two meals in restaurants. I have a thing about restaurants – at two separate joints I got very ill after drinking their tea. From that moment on I would only drink a Dr. Pepper, but now I am changing that to water. We buy groceries once a month so my game plan was to buy the fresh fruit and veggies that were on sale and then stock up on as many frozen and canned fruit and veggies as we could. Walking into that grocery store and getting excited about all the fresh foods we were putting in our cart made me feel like “I AM NO LONGER THE FAMILY’S TRASHCAN”! Let me explain that a bit further, you see our kids and my hubby don’t do leftovers. So whatever they ate I took to work for the next several days, whatever it was, because I don’t like wasting food and throwing it away. My two splurges were a $10 bag of chia seeds and $3 carton of almond milk. If we set aside all of the non-grocery items we needed to buy at the same time (i.e. hair products, socks) we actually did spend less than we normally would have. I went prepared with about 10 recipes I knew I wanted to try. I tallied up which ingredients were used the most so I could choose between buying certain ingredients if I had too. After I stuffed all of our fresh produce in the fridge crisper bin I realized I should probably look into how to tore veggies properly. Lo and behold each one was different. I frantically ran home to chop up and freeze what I needed to and repackage the rest. Since most of the food was going into smoothies it actually made sense to freeze them (celery, green onion, bananas). I was brave with the first smoothies I made…it was a “green machine” type. Packed full of spinach, banana, radish, and pineapple. I was so amazed at how the spinach is so easily masked by fruit. The second one I made was nothing but fruit, just a personal treat for myself. I added a bit of honey to it but it really made ti too sweet for me. My how times have changed, I would have never said that a year ago! March 5th happened, it’s time to get serious, the first day of lent. this couldn’t have been a more stressful day than it was. I was busy all day at work and the carpool was 20 minutes late picking me up. That meant I wouldn’t have time to run to the store on our way to the service. But wait, the pharmacy closes before the service will be out and my son really needed his asthma medicine, there would be no other time for me to go. So we ran into the store for just his Rx, was a tad late to the service, then went back to the store to pick up everything else we needed. i was pissed off the whole evening,my top cardinal rule is to be on time! I twas 9 o’clock when we finally got home. I let the kids snack on leftover communion bread in the car because it was straight to bed for them. I luckily resisted temptation, but was starving myself. Fixing a salad from scratch was too time consuming for an already long day so I grabbed two egg rolls from the freezer. The Crystal meal plan really requires last minute forethought, something I’m sure I’ll get the hang of after 40 days. My first fast didn’t go completely as planned. I made it through till dinner with little effort. I could have made it through dinner too but we had a potato soup kit that was about to expire. While my doctor suggested leaving potatoes out of my diet, I still don’t like to waste food. My friend found her wake up call through Joe Cross’s “Fat, Sick, and Nearly Dead” video. The hubs and I found our wake up call through Jamie Oliver’s “American Food Revolution.” A co-worker found her wake up call through “Food, Inc.”. We are killing ourselves and killing our children and it all comes down to education: knowing what foods are out there, knowing how to prepare them, knowing how to put a proper meal together. I’m realizing more and more how many people in my office building are over weight and sadly, clearly obese. With GMO’s increasing the size of our food, it’s not wonder we too are increasing in size. By March 11, I was getting tired of my eggs in the morning and wasn’t all that hungry either. I switched to having a smoothie for breakfast with a light lunch and dinner. I started a 30-day ab challenge with my friend who is now officially a Beach Body coach. March 17 was hard to get through. I attended the annual Rebekah Assembly of Texas which included three banquet meals heavily laden with breads and sugars but I think overall I did well. I kept up with the ab challenge too. By March 25 everything was going well both with the diet and ab challenge. I had a runtastic run with a new personal best 6K time. 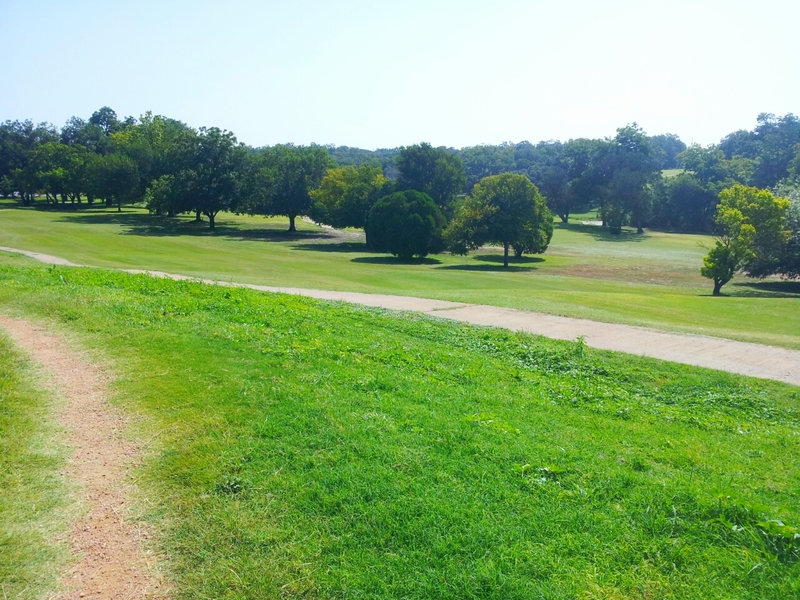 I was able to keep up with a pace of running 300 steps then walking 50, and made it running up to the top of the massive hill at the golf course. I was down to 166 pounds (17 pounds lost so far)!! I had to take in my sports bras!! All of my cloths fits much better or are now too big and need to be taken in!! Last night was the most challenging so far. It was hair-cutting night for my kiddos followed by dinner at the Double Dave’s next door.We ate there last week and had a wonderful vegetarian pizza with whole wheat crust. Tonight however they were having trouble keeping up with the buffet demand and i only managed to grab two slices. I was still quite hungry though so I broke with my lent diet and had the smallest Stromboli stick I could find and small slice of chicken pizza. I will soldier on today and keep moving forward! There are only 5 days left in the ab challenge and I’ve already started a new one for arms and one for squats. My hubby is now on board with my new eating habits and cross-training more too. My friend is trying to get me to become a Beach Body coach too. I’m considering it, but I think my hubby would be even greater at it. However, neither of us has a “salesman” personality. If this turns out to be like selling Avon, Tupperware, Scentsy, Pampered Chef, etc. I don’t think we’ll be that successful at it. I have a big meeting with my friend this weekend to discuss it in detail. If you have every done online coaching or used an online coach I welcome all of your thoughts on the matter!! When walking or running with kids (for some distance) I find it to be more pleasant if they have something to focus on. Last weekend Chatterbox and Hugs counted pumpkins and ghosts seen along our walk. Chatterbox gets really bored really fast on our walks longer than a mile. Counting helps him make it through the walk and keeps the mood light and fun. It also served as a great distraction when he realized he needed to go to the bathroom and we were two miles from the car. What to do when there aren’t any Holiday decorations out? We have sang the alphabet song, counted to one hundred, practiced counting by 5’s and 10’s, counted dogs, and counted flags. Usually something will my catch my eye from someone’s yard and that’s what we wind up counting. A few years back I came across the Fitbook. A cute small notebook used to track twelve weeks worth of exercising and eating. I absolutely love it. Writing down our goals and keeping track of our progress helps make your goals real and achievable. You build motivation in too. Each week, when you meet your goal you earn the reward you chose for yourself. It’s a great idea…if I run every day this week and stay below 1800 calories per day I’ll reward myself with a new running outfit. Sounds great on paper but is a booger to our budget so I never worry about the rewards anymore. 95% of our meals are prepared at home so figuring out a calorie count each day can also be speculative. Last year it came to the point where I needed more space to record my workouts and less of some other sections, so I created my slimmed-down version, full page size, that covers only six weeks at a time. 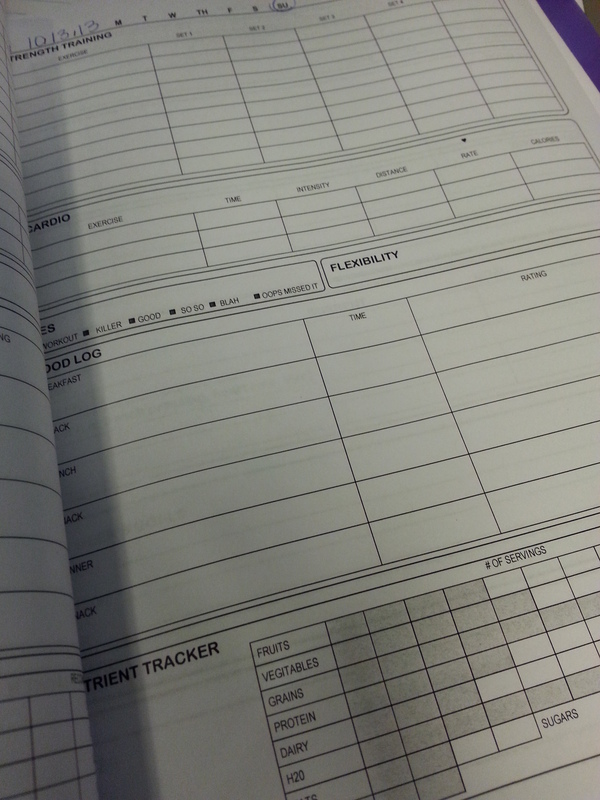 If you can’t afford the Fitbook every twelve weeks, create a template that works for you and start recording what you do. Don’t let money stand in the way of meeting a goal. A while back I wrote about a selfish fellow runner whose locker, #5, was beside mine. I haven’t seen the runner in several months and finally tracked down the information I speculated. She retired and my fellow locker room users couldn’t be happier. Apparently we were all suffering in silence. Chatterbox, who dressed as Batman, and I ran in the CASA Superhero Run this past weekend and had a blast. I ran with him for his 1K, which he ran the whole way, I was so proud. I actually skipped my 5K because he was having so much fun with the arts and crafts, snacking, photo-taking, and all goings on under the hanger. Luckily, just like last year, it was cloudy and cool. Unfortunately, I didn’t take many photos, we got too caught up in all the fun. I surprised myself by picking up our packets ahead of time, something I never do, but it allowed us to sleep in and avoid a very long line when we arrived. I didn’t expect the Hubs to bring Hugs along, which they opted to stay home. 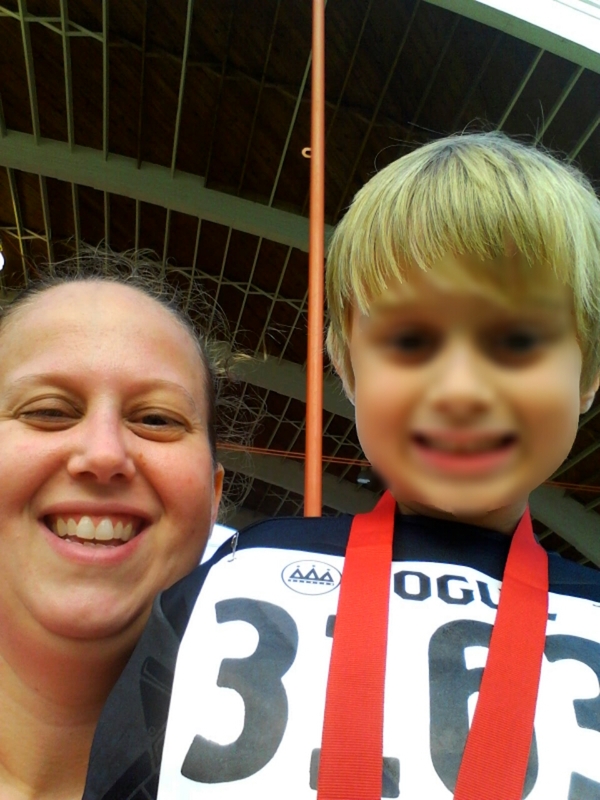 However, there were several parents walking their toddlers through the 1K so next year I think I will drag him along too. I didn’t even have a cape to run in this year, so next year’s goal is get myself totally decked out. There are two ways to go, a traditional superhero costume, or an invented superhero. Once I live and work in the same city I am so going to volunteer! 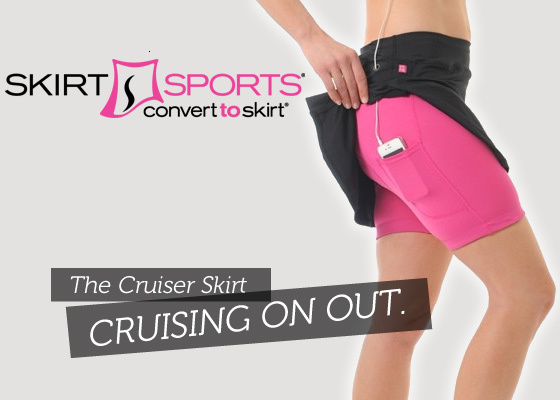 Earlier this year I came across an advertisement at Fit Frosting for the Cruiser Skirt. They were announcing a last minute sale before they stopped selling them and of course the last day was at the end of the month so I didn’t snag one, but what a genius idea! Fast forward to August when I tripped and fell while running. I had to make a split-second decision to either save my phone and risk badly damaging my knee, or let the phone go to brace my fall. I decided to let the phone go, after all it had made it through countless falls before. Not this time though, it fell just right, on the corner and cracked the glass. I immediately went home and hastily added phone pockets to my running pants. There are a lot of things to consider when doing this I discovered. Running pant #1 – my oldest pair, had already been hemmed up quite a bit to land just at the knee. I started with this pair first thinking that if I totally screwed it up, oh well, they were so old I could have used a new pair anyway. This is mostly cotton fabric with a bit of elasticity incorporated into the fibers. 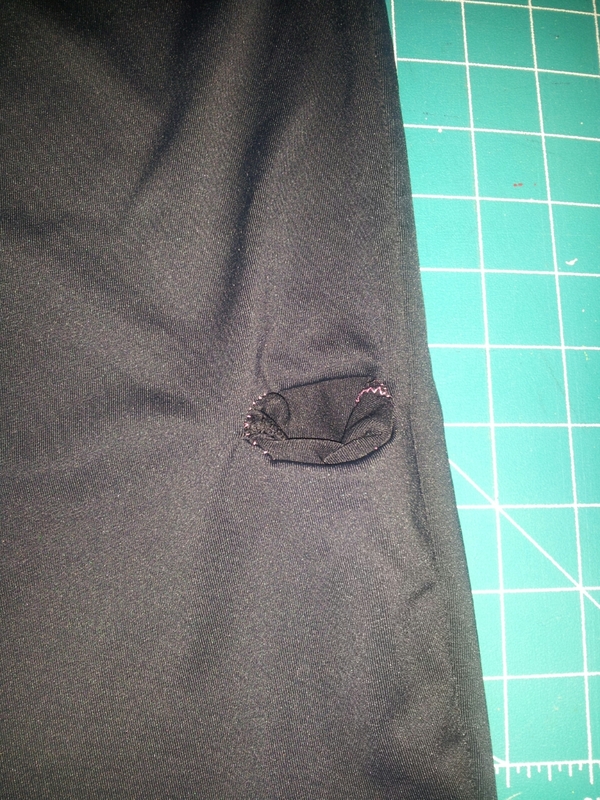 I cut off the legs where I had previously hemmed it. Using my phone as a guide I roughly estimated the size of pocket I would need. 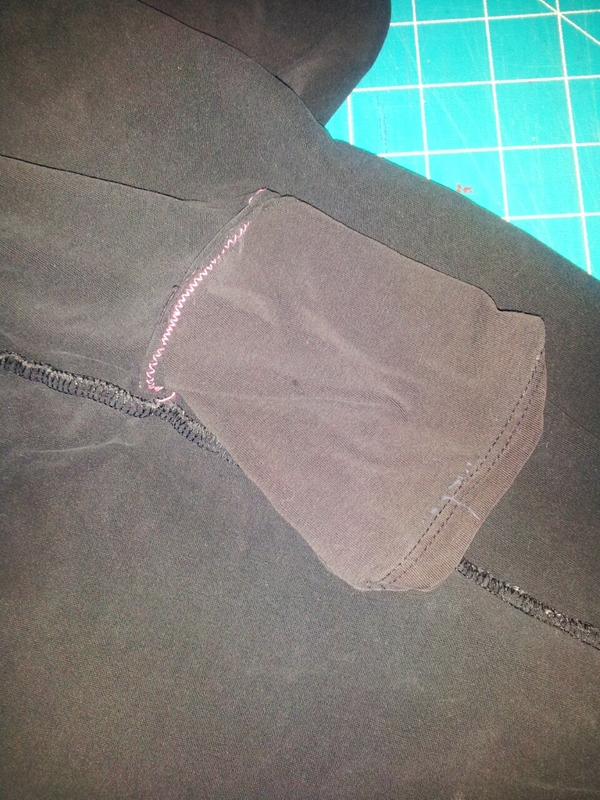 I then cut a slit into the pant about where I thought the cruiser skirt had their pocket and used a zig-zag stitch to secure the pocket. Turns out the pocket is a bit lower than I would like and my phone sticks out about 1/2″ which makes me nervous but it has worked so far. Running Pant #2 – considering the first pant was a success I tackled my only other running pant. 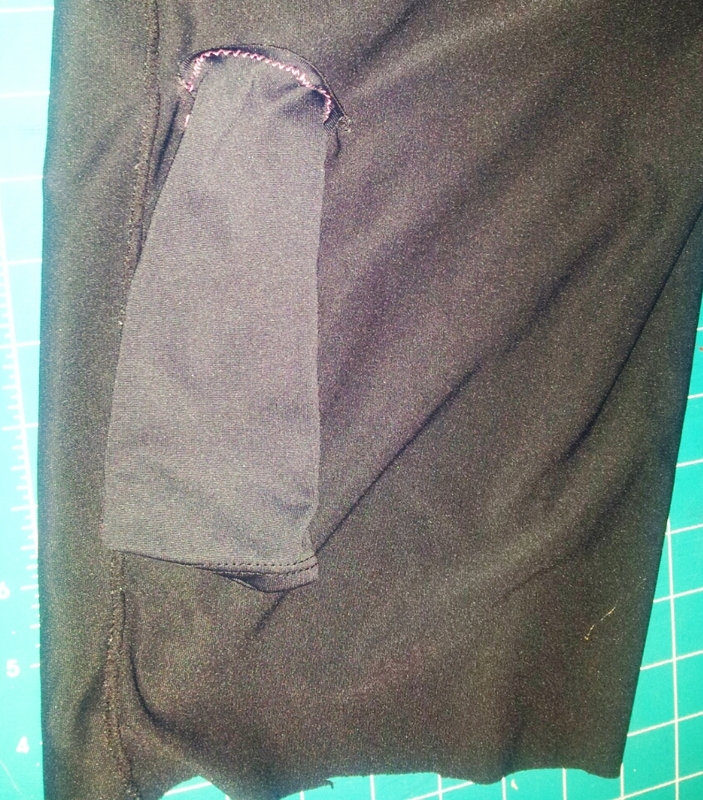 I wanted to hem these up anyway, so I trimmed off the excess to use for the pocket. This material though is pretty much Lycra through and through. I learned my lesson with the too short pocket so I paid extra attention to making this pocket long enough to completely cover my phone. The flaw here is in the fabric. While the pocket completely covers my phone, the material is so stretchy that it tends to bounce while I’m running. 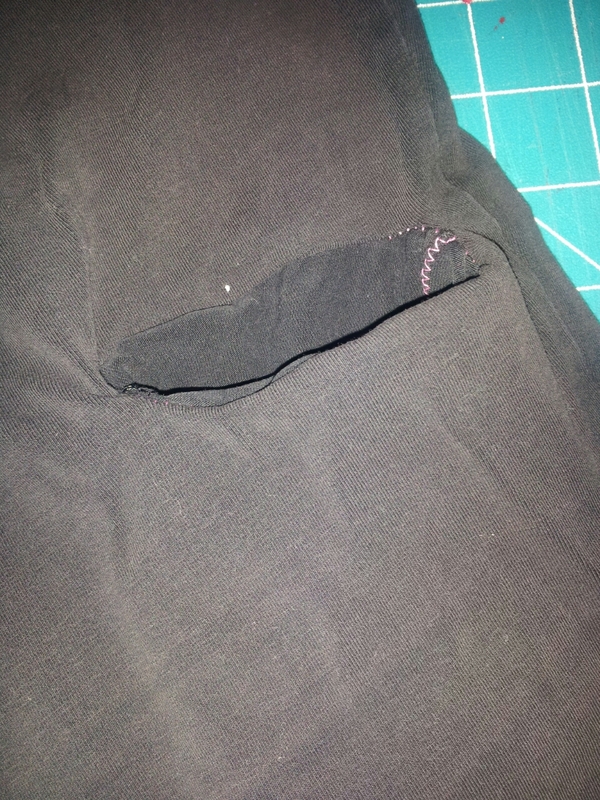 I plan to modify it by tacking down all sides of the pocket to see if that will help. Why was I running with my phone in my hand in the first place you may ask? While I would love to have one of those fancy watch-type GPS systems to track my running, I don’t, I use a free app, Cardio Trainer, on my phone, plus I was also listening to FM radio while running too. I had been having problems with the built in GPS locating me when I kept my phone in my bra, so I got in the habit of carrying it instead. The hubs has convinced me to spend a few extra bucks getting a protective cover for my replacement. A friend of mine started a 30-day plank a day challenge. It sounded fun so I participated. You gradually increase your hold time from 20 seconds to the final 5 minutes on day 30. Piece of cake! My running regimen has kept my chronic lower back pain at bay…that is until day three of the plank-a-day challenge. I slowed down the pace and stretched the whole challenge out to 60 days. I finally made it 2 minutes around day 20 and had to stop. It was just too painful and was ruining my runs. This experience also tells me that clearly I still need to strengthen my lower back muscles, and to not rely on running alone. A great alternative I found is the Superman Stretch. It works that same troublesome area of mine but is much more gentle. 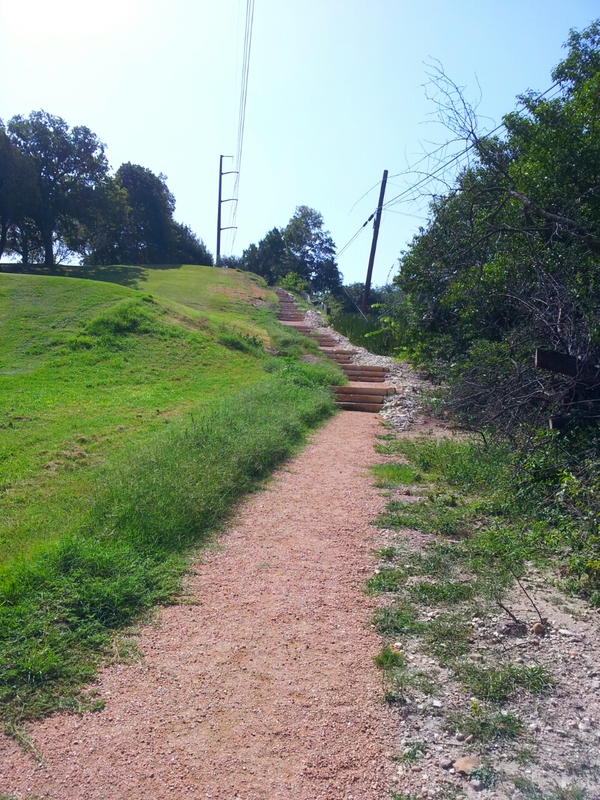 Several weeks ago while running errands near the office I noticed a nice crushed granite walking trail around the local golf course. The trek from the office down to the golf course, running around the golf course, and then double backing back to the office is right around 6 kilometers so it’s a bit of a stretch for me to complete the run within my lunch break hour. 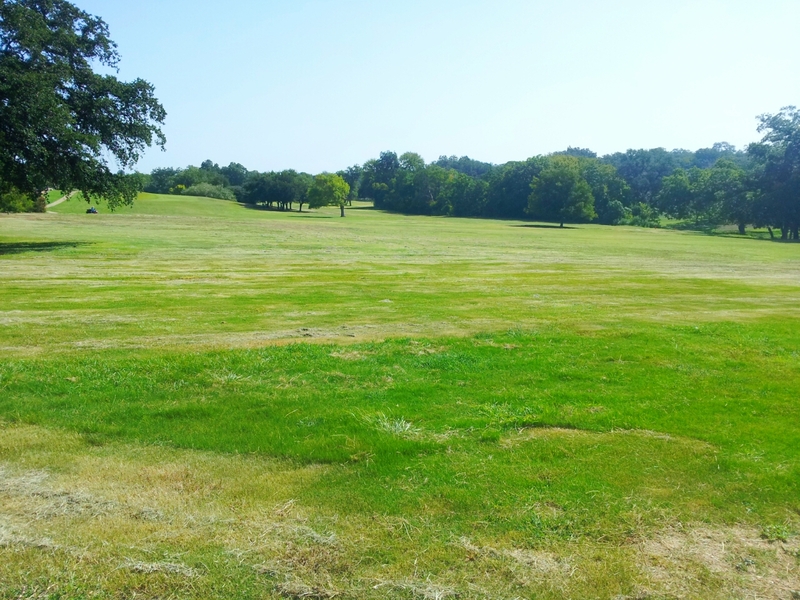 It is so nice to run on crushed granite versus asphalt and concrete though, plus there are a few great hills here too, however there is very little shade over the trail making it a heat stroke nightmare in Central Texas. I’ve decided to make this course my “long” run once a week. When the temps get cooler I can run this more frequently.